H.H. 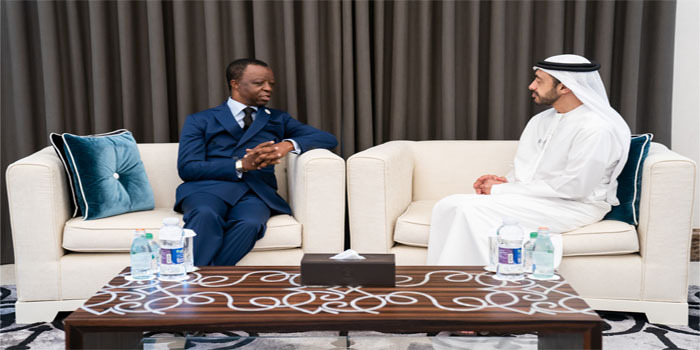 Sheikh Abdullah bin Zayed Al Nahyan, Minister of Foreign Affairs and International Cooperation, has received Roger Nkodo Dang, President of the Pan-African Parliament. During the meeting, held in Abu Dhabi, the two sides discussed cooperation between the UAE and the African continent, particularly in the parliamentary sector. Sheikh Abdullah bin Zayed and President Dang also exchanged views on a number of regional and international developments of mutual interest. Sheikh Abdullah welcomed the Pan-African Parliament President’s visit, noting the important role the parliament plays in developing bilateral relations. For his part, Dang hailed the UAE’s drive to strengthen ties with African nations, that serve the interests of both sides.